Behind the scenes sniping can drain energy from the best initiatives – how can the team be moving forward if one-half of it is pulling in the other direction? It’s a tug-of-war which can destabilize your authority and best efforts as a manager. So you are wise to be looking for ways to get this negativity under control. Fellow OP adviser, Erika Andersen has offered some terrific suggestions in Part I citing how these ‘nearly invisible interpersonal dynamics… erode the trust that’s essential to high-performing teams’. Now, I’m going to throw my hat in the ring with a few more ideas… You can’t stop people from saying negative things — so you may as well try to bring them to the surface in an atmosphere that you have some control over. The good news is: There are many creative tools to help you fight this. Your natural manner –which you describe as ‘calm’ and ‘matter-of-fact’ – sounds like you could wield these tools quite nicely. I am going to recommend three different tools. You can have some fun with them, and they will help you to bring these few naysayers and snipers into line. In ‘Six Thinking Hats’ de Bono teaches a method for conducting meetings that I think is brilliant and will be especially helpful to you. 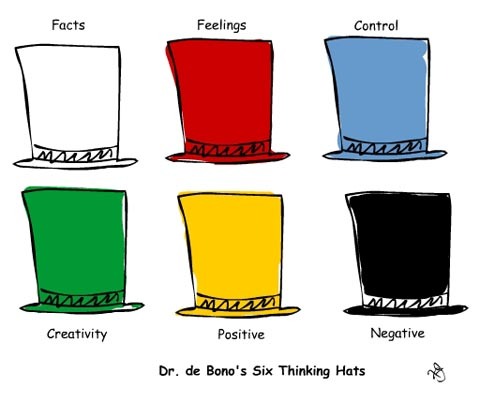 De Bono assigns a different color, and different thinking style to each of the six hats. It works to structure meetings and build consensus. It encourages groups of people to think in one direction at a time, to allow optimistic ideas to grow, and also negative ideas to be aired. It’s a very systematic style of meeting that can effortlessly control the naysayers in your group. For example let’s say you are discussing a new initiative that your entire group of eleven people has to work to accomplish. You would structure the meeting into six parts (representing the six hats or styles of thinking as above). Depending on your corporate culture, your colleagues may or may not be willing to metaphorically ‘pretend’ they are wearing the hats. That’s fine. So long as you understand the structure you can effectively guide the meeting. Human nature being what it is, the naysayers will want to be heard. It can be very frustrating for them to be sidelined by this type of disciplined thinking. They want to contribute but they are routinely – and politely – silenced whenever they voice an opinion that is not in keeping with that particular ‘hat’. The beauty of the Six Hats system is how it generates a wealth of ideas from 360 degrees. Ideas that you might have missed by going through a more conventional meeting style come to the surface. Everything is considered because you are methodically going through a checklist. Everyone gets to contribute. It is a fantastic system. The ‘Six Thinking Hats’ system can be combined with a Creative Vision structure. We use it in our creative projects with clients. It is an easy and powerful way to structure creative ideas, and get everyone contributing value. 1. Imagine the ideal scenario for Project X if everything goes perfectly. 2. Identify the hurdles that could prevent Project X from succeeding. 3. Create an action plan with timeline, deliverables – and names attached. With both of these methods, you will want to have a record keeper on hand to write down what each person’s contribution is and keep track of the flurry of new ideas. Everyone loves to get recognition for their ideas, so the record keeping is an important step and of course it is essential to crafting an actionable plan afterwards. Negative ideas have their place in any project plan. By voicing them, we actually have an opportunity to troubleshoot and counteract the problem. It may surprise you how the ‘snipers’ rise to the challenge and become quite adept at troubleshooting. You may want to look into some training games or team-building exercises. They can be very useful in shaking things up. Although you appear concerned about only a few people on your team, these activities can benefit everyone. The objective here is to jolt people out of their normal patterns of behavior so you can all feel charged up and renewed. You want to create new patterns of behavior so that the little annoyances become less irritating. Think of furrows in soil. Imagine how water directed into those furrows will follow the existing pattern. Now, if you had a garden rake you could erase those patterns. But without raking, the furrows would just get more and more ingrained. So think of training games and team-building exercises as a means to rake out the established behaviors and create new (and healthier) channels for interaction. One book you could take a look at for ideas is The Big Book of Humorous Training Games . The authors Tamblyn and Weiss have a section on dealing with difficult people that has some clever games in it. My favorite is the one on trigger words (and how to avoid using them!). Also, you could plan out-of-office events that help you to see your colleagues from a different perspective. Ideally these new events will help all of you to associate some positive experiences with your colleagues that can help outweigh negative, ingrained associations — and get you all pulling in the same direction. I hope some of these ideas are useful to you. Thanks for writing to Office-Politics. Lovely, thanks. Lots of ideas to try, and I’ve looked at De Bono’s work a lot in the past, but had forgotten about it in this context.